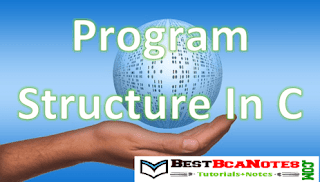 Before going to learn c programming we must know about the program structure in c. general design of a c program refers as a c program structure . 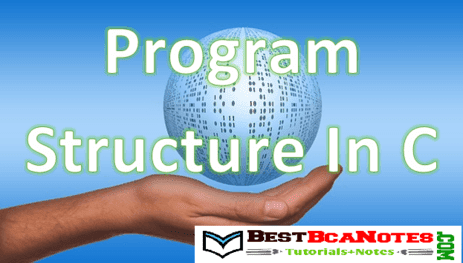 In short we can say that it is an sample format to know how to write code in c.
In c programming the program code has written in following format. include section contains different header files of c programming language. All the built in functions ,keywords, etc are embedded in the libraris. This section links program to the c libraries so necessary functons can include in program. It is the entry point of c program. Program exection started from the main function. C program must have an main function in the program. Variable can be declared in main function and user defined functions also. According to where the variable is declared it is differentiate as global and local variable. We will see the difference between local and global variables in later sections. We can declare any number of functions. The functions declared by the user are known as user defined functions. Functions devi code in multiple blocks so it simplifies the programming. Statements refer as the code written other than variable declaration and function declaration. Some examples of the statements are if statements,for loop statements etc. Comments are used for better understanding of the program. It is useful to give the explanation of code. Comments are ignored by the compilers. You can put comments anywhere in the program. In short in above lesson we saw the which contents are useful to write the code. We will see the more elements in later sections gradually.